Sounds like a scandal that might blow up– after all, why would a cis-woman like myself refuse to fight for women’s rights in the 21st century? Surely, she must not believe in giving a voice to women, let alone support “girl power,” in general? That she finds the patriarchy justifiable, and that men shouldn’t let women take the lead in the fields of politics, business, and social issues? First of all, I didn’t say that I refuse to fight for women’s rights– I merely said that I don’t consider myself a feminist. In fact, I do care about women’s rights, and I do want women to have a *louder* voice, as well as more recognition and opportunities in society. 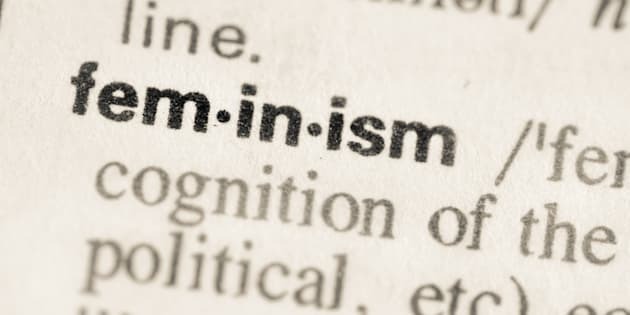 “Feminist” is a label which I’m not comfortable calling myself, especially in today’s day and age when the term itself is really questionable. Secondly, just because I don’t identify as a feminist does not mean that I support the patriarchy, let alone misogyny or toxic masculinity. I think it’s common knowledge, among both men and women, that misogyny and toxic masculinity should never be justified. While I do believe that women should be given more opportunities (e.g. jobs, education, discussion), it should also be those who are qualified, who are competent and have something unique to bring to the table (and not solely based on gender). Same goes for men who are competent and qualified, and not just because they’re men. The definition might appear simple, but actually, there are two parts to it, each part contingent on the other. On one hand, it states that feminism is “the advocacy of women’s rights”– pretty straightforward. On the other hand, this can only work “on the basis of the equality of the sexes,” which doesn’t mean tearing down men in order for justice to be served. Unfortunately, I’m seeing many women nowadays who are twisting the term to argue for their own personal gratification, not for the greater cause. Many of these women are often in their teens or twenties who’ve grown up with the Internet, and who’ve been exposed to plenty of female celebrities and media influencers who are misguiding them about feminism. Being naive and impressionable with misinformation is a dangerous combination, and we’ve seen the trend– on social media and the news– of these young women taking what they’ve learned and just acting so tactless, even obnoxiously. Look, I appreciate that they are raising their voice to address an important societal issue that has been around since what seems like forever. Especially when there have been moments in history where women didn’t have the same rights as men (e.g. pre-1918 United States, when women couldn’t vote). However, I’m finding that they’re doing it in all the wrong ways, from yelling at people who disagree to even shaming them on their opinions. That’s no way to get people to agree with you, or even respect you. It’s no wonder, then, that “feminism” has become such a negative term nowadays. We’ve seen it all, starting from the pejorative connotation of social justice warriors (or “SJWs”) in the early 2010’s to today’s slew of female celebrities like Lena Dunham, Halsey, and Lilly Singh (aka iiSuperwomenii) getting backlash for their “feminist” views. Not only that, but also the millions of young SJWs all over the world who have no idea what they’re fighting for. Thing is, many of them are often entitled and haven’t done their research– and no, being a Halsey fan does not count. Before anyone goes and rips on me about hating Dunham, Halsey, and Singh, no, I don’t hate them. Do I find them annoying? Yes. But I don’t hate them. In fact, I try to separate their opinions from their careers. Okay, I didn’t like Girls, but it was a successful show, and Dunham did a half-decent job of relating to lost twenty-somethings in the 21st century. I actually do like a couple of Halsey’s songs and I do appreciate what she’s done for the LGBT community. And I do enjoy watching iiSuperwomanii on YouTube– she’s no doubt a successful woman, having hustled her way to the top, and she’s done a lot for her charities so far. Sure, I would say that these female celebrities are role models for girls. But they’re also human, meaning that they’re bound to make mistakes. That’s why it’s important to also acknowledge them as humans and not as God-like figures. It’s crucial to think critically, to assess blanket statements about any issue (e.g. feminism, racism, sexism) from both sides. While I’ve never been a SJW, I admit that I had those leanings when I was in college. Looking back, I realized just how unique the college environment was– in essence, it’s a bunch of students (mainly in their early twenties) who are in an education bubble with limited access to what the “real world” is. It ends up creating a population of entitled individuals who can’t voice their opinions tactfully, nor having the capacity to listen to what the other side has to say. Not to say that all college students are like this, but those who are as such, well, I find them to be just as ignorant and awful as misogynists. Eventually, I graduated college, got a job and moved, and was exposed to the real, harsh world. Where feminism wasn’t necessarily a thing in the country I worked for, or those I visited. That people aren’t always politically-correct in what they say. I used to get really upset when such things happened, but I quickly learned to accept it. Of course, I would let people know when I didn’t agree with their views, but I couldn’t change their minds. Things aren’t black and white, but rather grey, and I learned that it’s better to take the moderate view than either extremes. What I’ve found was to do my research, more specifically to read articles and watch videos that countered my beliefs. That meant watching conservatives like Ben Shapiro and Jordan Peterson, and even if I didn’t agree with them, I can acknowledge that they justified their opinions well, with logic and facts. Unfortunately, we’re lacking such rationale these days, as people are too quick to get angry and personally-offended by comments made against their beliefs. Change doesn’t happen when people are pointing fingers at each other for their wrongdoings; it happens when we can be nuanced and tactful, and to have a good conversation about what the important issue is at hand. I think progress in feminism would go much quicker if we focused less on what’s dividing us, i.e. gender, and more on how to bridge that difference. Until that gets settled and the term is properly defined, I won’t be calling myself a feminist anytime soon. Let me know your thoughts about feminism today. I’d like to read them! I would consider myself a feminist in that I want equal opportunities for both genders. Women deserve better than what they get these days. Just be you and all will be good. I agree with your idea on wanting equal opportunities for both genders. My problem is that we don’t have to alienate one gender in order to bolster the other, i.e. feminism. We also don’t need to label ourselves as feminists and rather just be supporters of equal rights for the sexes. From what I see today, I suspect such “rationale” is quite rare. Hence, I suspect that improvement in many areas of controversy is unlikely. Agreed. Rationale is a rarity, as people prefer to argue with emotion. Unless we calm down and listen to others before speaking, progress won’t happen otherwise. Do you think either Republicans or Democrats, generally speaking, use rationale? This isn’t limited to just feminism though. Those who consider themselves ”woke” or ”activists” tend to fall into that rut too. I shared an opinion on a Facebook post about criminal justice and how it relates the black community. The backlash was horrible. It wasn’t anything in depth but the insults. I feel like Rip van winkle. Like I went to sleep during a decade of debates and woke up to such chaos. I completely agree with you. Besides hating the word “woke” (just sounds pretentious), those who are “woke” aren’t even doing it for the community, but rather for their own validation by others: they want to be seen as aware of the politics with social justice movements, but in fact they only have skewed opinions and a “lazy activism” feel to it (i.e. they just retweet/reblog activist posts on social media, but that’s it). I don’t know what exactly you shared about criminal justice and the black community, nor do I know how exactly the people reacted afterwards– but if it was that caustic, then it sounds unreasonable. All I said was if the person was guilty then they should do the time. It was in reference to a post about Kamala Harris locking up black men. Yes, I can see how the Harris post could trigger people’s reactions, especially in this day and age’s “Black Lives Matter.” Just mentioning race will incite a flood, and while I do believe that we need to talk about race (especially about racial discrimination in crime), so-called “woke” people aren’t talking, but rather yelling and shaming others who don’t associate themselves with the movement. These days I believe the term “feminist” is becoming overused and skewed with the popularity of social media and the celebrity culture. You have hit the nail on the head with your post! Thanks! I agree that “feminist” is a buzzword nowadays, in that it’s frequently used, but it has little weight to it anymore. Not great, especially for the cause. Thank you for saying this! Third-wave feminism is too strong in it’s approach. Yelling, alienating those who don’t agree with them, and cutting down men’s rights to bolster women’s is not only counterproductive, but bordering toxic. We can work on equal rights on equal sides. You’re welcome! I appreciate your thoughts, too. When it comes to promoting equal rights, it’s rather ironic that third-wave feminism is making it unequal between both genders by saying that women are entitled to everything (e.g. jobs, money) just because they’ve been “oppressed” by men for years. If a man were to say that, there would be an outcry, so it’s strange that it would be legitimate for women to say that.